In order to work with the domains and FTP accounts you need to click on the WEB panel in the top navigation section first. It will then open up with options in the bottom section for configuring the domains and FTP. When you click on the domain and hover the mouse in the top right hand corner of the bottom section there will be an option to edit the domain. This will be the opportunity for you to create an FTP account, info of which can be sent to your e-mail account. Once in the Edit Window you have to scroll down the Window to find the “Additional FTP” link to create the FTP account. Once the Additional FTP link has been clicked you can complete the information for an FTP account of the domain. 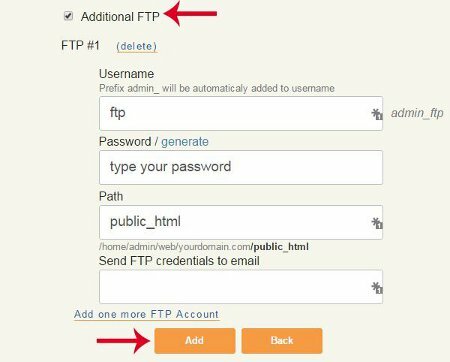 You cannot work with FTP unless you’ve created a FTP account first. You also have to make sure that your domain has propagated first before you can use the host domain to access the server via FTP. In other words, if it is your own domain you need to go into the Registrar Account of your domain and add name servers to it first. Then give it some time for the DNS to propagate first.